The Clarion ProAudio DPH7500z signal processor creates an incredible world of extensive tone control, dazzling sound effects, and superb digital sound quality. Connect this outboard processor to any compatible Clarion receiver (must have a "z" in the model number and EQ/DSP capability), and enjoy in-dash command over a wide variety of sonic parameters. You can operate the DPH7500Z processor in "Easy" or "Professional" mode. "Easy" mode includes graphic equalizer (7-band adjustment, 6 preset and 6 user-adjustable curves), listening position (6 positions), and soundfield (12 preset, 6 user-adjustable) functions. The "Professional" mode allows for even more pinpoint control for the competitor or audiophile, including vehicle-specific EQ presets and parametric EQ. Test-tone outputs, high- and low-pass crossover capability, titling for custom settings, and 4-volt outputs are some of the other features you'll find on this amazingly versatile unit. The Clarion DPH7500z will bring you the flexibilty, clarity, and power of digital sound processing. Attached to the product registration portion of the warranty/product registration card is an offer for two-year warranty coverage on all Clarion Pro-Audio products, excluding speakers, that are installed at the same location where purchased. This offer is validated when the dealer's and installer's signatures are obtained and the card is returned to Clarion. The offer does not apply to mail order purchases. Since all control of functions is through a CeNet connection, this unit can ONLY be used with CeNet Clarion headunits equipped with EQ/DSP control. This unit uses digital signal processing for surround sound effects, equalization and crossover functions. Fine-adjustment of Listening Position (Easy Mode): Adjusts sound quality so that it sounds best at one of the following six positions: (1) Full-seat; (2) Front-Right; (3) Front-Left, (4) Front (5) Rear and (6) PASSenger. 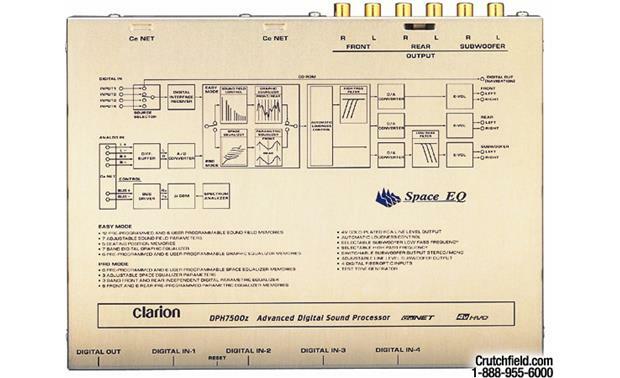 Space Equalizer Settings (Professional Mode): This unit is preset with six Space EQ settings for the following space types: large-scale sedan, small-scale sedan, large-scale wagon, small-scale wagon, large-scale van and small-scale van. The "DIFFUSE", "CAR WIDTH" and "CAR LENGTH" parameters may be adjusted to change the sound pressure distribution of each setting. In addition to the six presets, up to six user settings may be entered into memory. 3-band Parametric Equalizer Settings (Professional Mode): This unit is preset with six Parametric EQ settings for the following speaker system types: (1) sedan with 2-way (component) front speakers and rear deck speakers, (2) sedan with full-range (coaxial) front speakers and rear door speakers, (3) wagon with 2-way front speakers and rear speakers on the sides of the luggage area, (4) wagon with full-range (coaxial) front speakers and rear door speakers, (5) van with 2-way front speakers and rear speakers on the sides of the luggage area, and (6) van with full-range (coaxial) front speakers and "equivalent to rear door speakers". Three bands may be selected and adjusted for the front outputs, and three bands may be selected and adjusted for the rear outputs. The channel selection (front or rear), selection of center frequency (20-20kHz in 1/3 octave steps, 31 points), Q-curve setting (1, 3, 5, 7 or 20) and gain Parametric EQ settings may be adjusted. In addition to the six presets, up to six user settings may be entered into memory. Test Tones: Can be output in sequence from the speakers to check speaker connections. Four Digital Inputs: Non-standard Optical fiber digital inputs used to connect this unit to compatible Clarion CD changers or head unit. One Digital Output: Non-standard Optical fiber digital output; no current use. Front Output: Gold plated RCA stereo outputs, to amp or to source unit input. Rear Output: Gold plated RCA stereo outputs, to amp or to source unit input. Sub Output: Gold plated RCA stereo outputs, to sub amplifier.